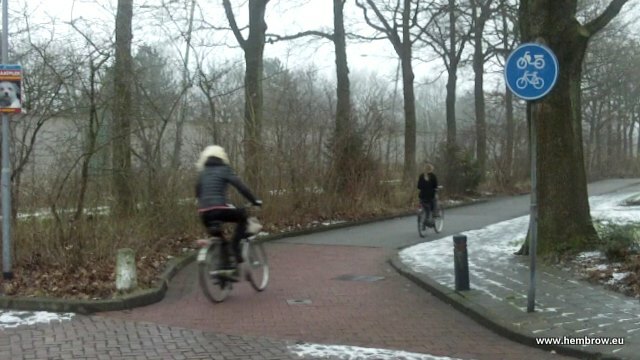 When new roads are built in the Netherlands, the old road is often retained to function as a through route for bicycles. Maps from the 1940s show this as a direct through route for all traffic. A new ring road was built as a bypass of the city in the 1960s as this area was developed and the old main road was no longer required to operate as a through route. Over time, the older road became more fragmented and less useful to drivers, but it has retained its original purpose as a through route by bicycle. This video and blog post show what the old main-road now looks like. this path has been removed for winter. Motor vehicles are kept entirely away from bicycles. This results in a degree of subjective safety which is high enough to encourage the entire population to cycle. It is not permitted to cycle on the ring road. However, there is also no reason why you would want to. There are a far wider range of routes available by bicycle. Using the bicycle routes avoids almost all traffic light junctions and allows shorter distances to be travelled to get to the same destination and therefore they lead to shorter journey times than would be possible if we cycled on the roads which are for cars. The noise barriers were installed in 2007 when the ring road was widened to cope with increased traffic due to further expansion of Assen and this separated the old main road from the new ring-road. In the video we travel from A to B along the wide red line. Not only do cycle-routes like this result in cyclists being very safe, but they also result in faster journeys by bike. We avoid one set of traffic lights which we have to stop at if we were in a car. 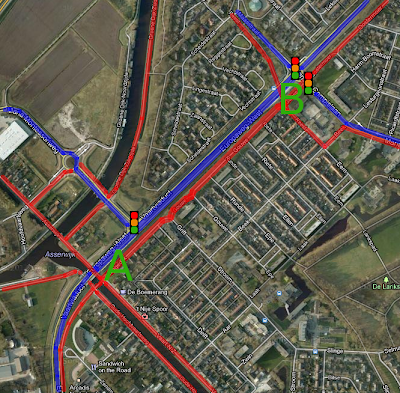 We also have a far wider variety of side-routes which can be taken without stopping at any traffic lights. It is only the straight on route shown in the video which involves cyclists stopping at traffic lights. It's important to note that not just any back roads will do in order to make an efficient cycling route. This example works well because the cycle-route is direct. It works because this was once the main route. In other locations the only way to create an efficient route for cycling is by building cycle-paths, because otherwise cyclists would be shunted onto inefficient indirect routes in order to maintain safety. It is important that cycle-routes are always direct and preferably that they avoid delays such as at traffic lights. 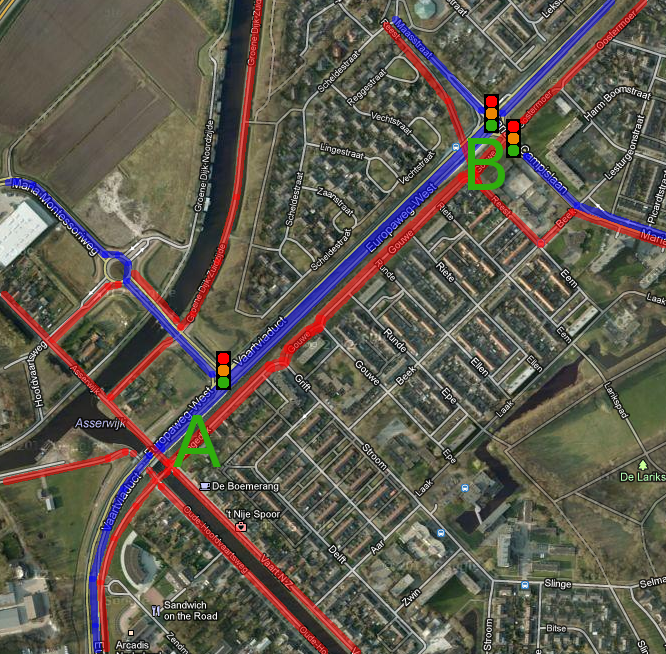 Some of the many places where you can cross the ring road efficiently by bike are shown in other blog posts (1, 2, 3, 4). There are other examples on the blog of how segregation can be achieved without building cycle-paths, and how unravelling of modes makes conditions better for cycling. Related, Schrödinger's Cat wrote an interesting post this week about directness of routes alongside main roads. Ik heb een pakket gekregen dit week van Bert. Geen contactgegevens. Hartelijk dank voor je gedachten, de brief en CD's, Helaas kan ik geen gebruik maken van de muziek in mijn youtube filmpjes vanwege auteursrechten. Like everyone I was surprised at the sudden announcement in London about investment in cycling. In typical London style, the press release quoted lots of baffling but impressive sounding numbers. As so frequently happens, these were mostly reported verbatim without any analysis, though some news sources inflated what was on offer to make a more impressive headline. At least one news source claimed that London was going to compete with Amsterdam. Just four days ago, London's "cycling czar" used the well worn excuse of Britain being "40 years behind" the Netherlands in a weasel worded blog post which prepared the audience for plans that would have no intention at all of "turning London into Amsterdam anytime soon" but which we were still to see as representing "a real shift in our ambitions for the bike". As it happened, I'd already written a blog post this week which pointed out that the "forty years excuse" is very commonly used to excuse inadequate action in future and it seems that I was bang on target for this announcement. The Netherlands spends €487 million euros every year on cycling infrastructure. That's over €30 per person per year to maintain and slowly grow from the existing strong base of cycling. This is a national figure, not just for Amsterdam, though Amsterdam's investment is about average. What London is being offered is £913 million. This sounds good until you realise that this is to be spread over ten years and is to serve a city which will have a population of 9 million people by the end of the ten year period. It works out as a mere £10 per person per year, or little over a third of the Dutch level of expenditure. Once past the impressive headlines from London you see that Andrew Gilligan's and Boris Johnson's proposed solution to being "40 years behind" the Netherlands is to spend a third as much as the Dutch and to do so for just ten years. How can that possibly work ? And of course the rest of the UK is not included in this. With just an inadequate plan for just one part of the country how can we expect Britain to be less than "50 years behind" at the end of this ten year period ? Looks nice enough, but the video glosses over the difficult bits at either end where cyclists have to join or leave this cycle-path. Oh, and actually cycle-paths like that already go everywhere in the Netherlands but are not thought worthy of press-releases. 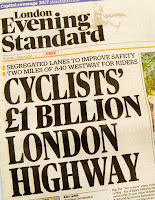 Quite apart from adding 10% to the amount to be spent in order to make a nice round "billion" for headlines, newspapers have also reported on a "15 mile segregated bike lane" which the original document refers to as being only "substantially segregated". Many sources reproduced claims without any critical analysis, including Dutch language sources. This is of course the intention of such a dramatic press release. Many sources quote a figure of "£18 per head", but that's only for one year out of the ten, a peak in 2015. Even this peak is still behind average in the Netherlands. What's more, this peak implies that actual expenditure in the other 9 years will be below the average of £10. For a start, setting a target of only around 5% of journeys by bike is not very ambitious at all. Nowhere in the Netherlands has such a low modal share and Britain has been promised more than this before. The lack of a serious target shows that this is not a real attempt to "catch up". which covers the whole country. The suggestion that bus routes cannot have segregated cycle-paths because "Everybody getting off or on a bus would step straight into the lane, risking being hit by a cyclist" is without grounds. In this country, best practice places cycle-paths behind bus stops and bus-stops provide cycle-parking for multi-modal use (sometimes for an extraordinary number of bicycles). (Update August: a few months after this article was written, London constructed an inferior design of bus stop which creates exactly the pedestrian/bicycle conflict problem they wrote about and branded it as Dutch, even though it does not resemble real Dutch bus stop bypasses at all. Similarly, the extension of Cycling Superhighway 2 was trailed as being of "Dutch" quality but includes a ludicrous junction design never found in the Netherlands). "Shared bus and bike lanes" are also certainly not "Dutch" and these also simply not good enough. They do not meet any reasonable standards for cycle provision and I'm not alone in thinking this. PRESTO guidelines also suggest that "buses, just like lorries, create greater hazards for cyclists than passenger cars" and that they "frighten cyclists away" and cause "additional stress and less comfort". Subjective safety is all important for encouraging a high cycling modal share. Given the small budget it won't be possible to achieve the needed change across all of London. For that reason I quite like the idea of the "mini-Hollands" (see footnote about the name). If they truly are "every bit as cycle-friendly as their Dutch equivalents; places that suburbs and towns all over Britain will want to copy" then they could have the desired effect. However, it will only work so long as these promises are met. i.e. so long as the areas they cover are extensive enough to be useful, they genuinely have high enough quality design to attract people to cycle, and so long as there really is an intention to follow it through over the rest of the city and the entire country at a later date. That may sound like a lot to ask, but it is not an unreasonable aim. The Dutch have already demonstrated that it is possible to do this over an entire country with double the population and over 20x the area of London. The "Central London Bike Grid" sounds positive. Joining up routes is vital. However, if this is inspired by the Dutch concept of a tight grid of very high quality routes then it really needs to be of the same high quality and density, and over the entire city, not just the centre. It's fair enough to start in the centre (and the "mini Hollands" should naturally have this as a matter of course if they're to live up to their name) but it must spread everywhere eventually. In the Netherlands, the importance of such a grid was known to be vital for attracting people to cycle so far back as the early 1980s. No cycle-route is stronger than its weakest link. "We will grade routes so people know what to expect" is a strange thing to put into the proposal as it's a tacit admission that not all the routes proposed will be usable by all people. Dutch cycle-routes do not have and do not need, grades. Every route in the Netherlands is suitable for every person to use. If London is truly building to Dutch standard then London's cycle-routes won't need to be graded either. Improving access to Advanced Stop Lines by providing a short length of cycle-path is not nearly enough. ASLs need to go. Yes the Netherlands also built ASLs in the 1980s and yes, some of them still survive. However, those which caused most problems have gone and the remaining few are to be found on relatively minor roads. It's just a matter of waiting for them to go, their days are numbered. New ASLs are not being built in the Netherlands and there is no reason why they should be built in London. London doesn't need to copy a mistake which causes conflict. Move on. Advanced designs of traffic light junctions do not put cyclists into conflict with cars. Why not try simultaneous green traffic lights in London. These are very successful because they remove conflict in both time and space. Why not just be cheerful ? For all I've written above I cautiously welcome the proposals because they do appear to offer London's cyclists more than they've ever been offered before. However, I call upon campaigners in the UK to stop behaving as if they are already victorious. There has been no success yet. All you have is a few nice mocked up photos and animations and some actually quite vague promises about how less than adequate funding will be spent. It's just possible that with enough campaigning effort this will turn into something great. However, no turf has been disturbed as yet. It is premature to celebrate or to write about "success". We must remain skeptical. I've been involved in cycle campaigning for long enough to have seen this sort of thing before. In 1996 I was one of the campaigners who celebrated the National Cycling Strategy, which was abandoned before anything had been achieved. In recent years, cyclists also seen the National Cycling Plan for England come and go with barely a whisper. Bristol was named as a "Cycling City" and several other places were named as "Cycling Towns". There was a lot of publicity, and just as in this instance many newspapers and websites reproduced the press-releases uncritically. that this wasn't good enough. London made many bold claims for the bike hire scheme and when the city proposed the very obviously flawed "superhighways" the resulting storm of publicity was sufficient even to make some Dutch people think they were about to be overtaken. However, publicity is not the aim. Cycling is the aim. Given past experience of promises made but not always kept, campaigners are not here to help politicians or councils make a name for themselves, they must judge their success on how much people cycle. Campaigners need to be very cautious in their support. It's important to stay focused and make sure that London delivers more than has yet been promised. That's why the serious campaigning must start now. Spokes point out that Transport for London's annual budget amounts to approximately £5 Billion per year and that the proportion to be spent on cycling is under 2%. They also point out that Edinburgh has committed 5% of its budget to cycling, but I suppose the smaller numbers involved don't make such impressive headlines. They certainly have not been used by a publicity machine so large as that in London. I read a few other reports including one on the Fietsberaad website which highlighted some facts not reported widely which I had missed. The plans include a near doubling of the London shared bike scheme to 11000 bikes and there are to be 80000 cycle-parking spaces built. It also suggested that only a third of the headline total of £913M promised has actually been sourced. Schrödinger's Cat pointed out that the figures were in the original document on London's own website, but had been overlooked by most people. So let's look at this in more detail. The bike hire scheme cost London £140 million pounds and operating costs work out as approximately £2500 per bike per year. Hopefully the expansion won't result in quite the same capital cost again, but clearly we need to expect it to take a good chunk out of the money already allocated and if operating costs increase in line with the number of bikes, that's £27M per year that London will be paying for a service used for 0.2% of journeys. Will it be good value for money ? As I pointed out three years ago, a lack of bikes was never the problem in London, it was just that people were scared to cycle. The bike share scheme could easily consume a third of the total funding that has been announced. the initiative to build more spaces. 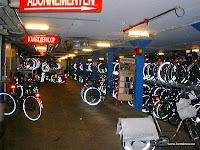 80000 cycle-parking spaces ? I was quite hopeful about because I thought it might make London's railway stations more comparable with those in the Netherlands. However, I then realised that these are not just for railway stations. but for all uses across the city. It sounds like a good number but actually it's only one bike rack for every 1000 citizens. As this is a ten year plan I think it's constructive to compare with the result of ten year cycle-parking construction plan which ran in the Netherlands. In 1999 a promise was made to install 200000 extra cycle-parking spaces at railway stations. In 2010 the 200000th of these stands was installed. A further 60000 spaces were then constructed by 2012 and the railway company promised that they would install 25000 more each year per year until 2020. You may think it's unreasonable to compare a single city with a whole country, but the population of the Netherlands is only double that of London. If London's promise had been 80000 more spaces at railway stations only in ten years, that would still have been considerably fewer per capita than the Dutch have already delivered over the last ten years and will continue to build for the next 7 years. Finally, the finances. 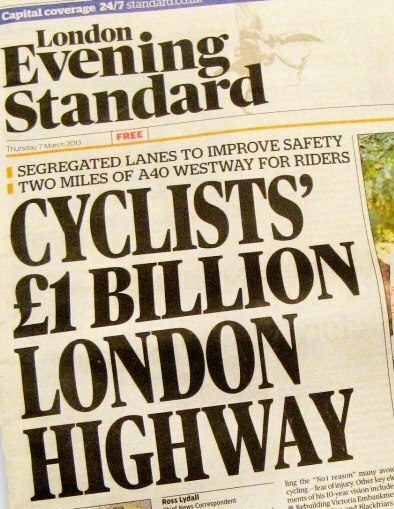 The Fietsberaad link says that just £300M has yet been allocated in London. That's enough to invest at Dutch levels in London for just 18 months. However it appears that this money is to be tapped into to pay for expanding the bike hire scheme and this may leave less than one year's worth of funding at Dutch levels. What can I say ? These extra figures are disappointing. Unfortunately, the more we find out, the more it seems was hidden by the initial hype. Who is the "Cycling Commissioner" ? The language of the "new vision" is lovely of course. It has convinced many cyclists that there is a real change in the status of cyclists in London and that was of course its job. However, in reality TfL has so far committed only 2% of the transport budget for London to this project and it has done so for just three of the ten years. So who is behind the language ? It is surely not for nothing that Boris chose to employ a journalist, Andrew Gilligan, as cycling commissioner rather than appointing an engineer to the job. If you want good headlines and to convince people without making any really large commitments then a good writer is surely exactly the person you need. I know someone there reads my blog because an expensive firm of architects that you asked to find out about Assen tried to get me to do their work for them for free. Why don't you give some credit ? More to the point, if you want to know about what you've read on my blog, why not ask me directly instead of asking someone else to ask me ? And if you want you planners to understand how the infrastructure here works, how about actually sending some of your staff on one of our study tours so that we can demonstrate everything to them. They can see it for themselves and benefit from our experience. We'd be very pleased to meet them and to show them what state of the art cycling infrastructure looks like. Take advantage of our extensive knowledge of cycling in both the UK and in the Netherlands - I'm quite sure we don't cost as much as that large firm of architects. London has sadly experienced a run of cyclist deaths and this has been followed by protests. The response from both Andrew Gilligan and Boris Johnson has been weak at best. Both have blamed cyclists for their own misfortune rather than accepting that the extremely poor infrastructure in London, which they both have responsibility for, is to blame. While both of these two continue to claim that no change to infrastructure could have saved lives, in the Netherlands people live on a day to day basis with infrastructure which achieves exactly that. Read my response to a visit to London this year or all the articles about London, which demonstrate many of the problems and dangers which the city poses for cyclists. One year later, nothing much had changed in London, but there were plenty of new press releases. Read my response: Another year without progress in London. Another year as passed and London still has little to show for it past a flurry of preposterous proposals, bad designs and voluminous hype. It's still the case that nothing significant has changed in London and as 2015 is the year of maximum expenditure this is the make or break year. Just over two years after I wrote this piece, the inadequate target of 5% of trips in London by bike by 2026 was abandoned. Please also read David Arditti's excellent response to the proposals. He's a little more positive than me, but he's still critical. LCC, TfL: Please stop talking about "Holland". Holland is to the Netherlands much as England is to the UK. You'll have noticed that Northern Irish, Scottish and Welsh people can get quite upset about parts of their countries being referred to as England. It's much the same over here. People from the 10 provinces of the Netherlands which are not either North Holland or South Holland would prefer that you refer to this country as "The Netherlands"
This morning I read yet another comment from a member of the British cycle campaigning establishment which said "It’s taken the Netherlands 40 years to get from where they were in the 70s to what you see there now". This excuse is used often in Britain seemingly as a reason why British campaigners should be happy with less than the Dutch have. But how true is it that the Dutch are "Forty years ahead", and how much sense does it make for campaigners who are supposed to be calling for change to repeat this message ? Should cyclists really expect no more than some minor variation of what they already have ? This is an example of defeatism. Campaigners should surely be looking to close the claimed 40 year gap and not making excuses for the country being so far behind. It is true that the Stop de Kindermoord protests (note: these protests were for the safety of children. i.e. something with wide appeal. 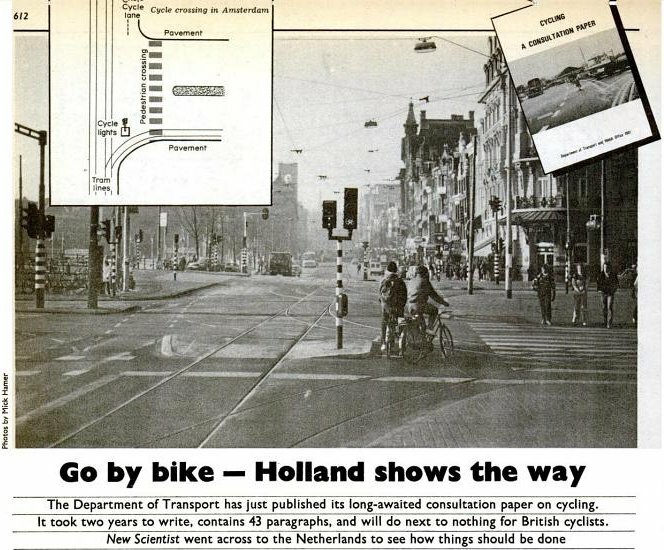 Not for "cycling") occurred forty years ago, but it is not true that it took forty years for the Netherlands to achieve a standard of infrastructure vastly ahead of what Britain has now. In fact, in 1981, just eight years after those protests, an article appeared in New Scientist praising what had been achieved and suggesting that the UK should copy it. After another 9 years, just seventeen years in total after the Dutch "Stop child murder" protests, cycling infrastructure and policy in the Netherlands were of sufficient quality that it was worth making a film about it. There are several stills from the film in this post. Follow the link to view the film yourself. 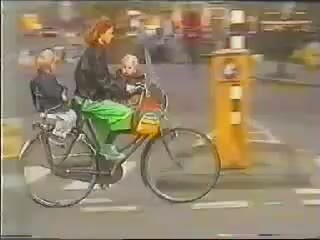 A mother cycling with very young children 23 years ago. These small children are now adult cyclists, perhaps parents. Useful change was achieved in the Netherlands within the time it took for a toddler to grow up into a teenager. Children for whom campaigning took place in the 1970s actually got to experience the results for themselves before they were adults. These children grew up into adults with the infrastructure which was built in response to the protests of their parents. Fewer of them died than would have been the case if those protests had not been listened to and their children now benefit from the inertia gained during that period of time. Why so little progress in the UK ? So what has happened and continues to happen in the UK ? Has the UK really had less time in which to achieve results, or is just that no real effort has been expended in cycling ? Why has progress been so slow that it can't be measured at all ? Where were the campaigners during all this time ? Have they not had time to respond to the lack of progress ? scenes like this, and never will. I noted a few blog posts ago that the Cambridge Cycling Campaign was established seventeen years ago. 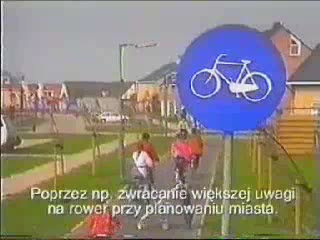 The organisation has been in existence for the same amount of time as it took for the Netherlands to change an entire country's streets to the point where the Bicycle Masterplan video first show-cased the quality of Dutch cycling facilities to the world. But the Cambridge Cycling Campaign is, like many smaller groups, actually a relative newcomer to campaigning. London Cycling Campaign was founded in 1978. 35 years have passed since they began their campaign for London's cyclists. Sustrans was founded a year earlier than LCC so they've had 36 years in which to foment change right across the country, like the LCC, they've existed for twice as long as it took to transform the Netherlands. This post was prompted by the text quoted in the first paragraph, written by someone who often speaks out on behalf of CTC. It's a common claim in the UK, and I'm not rounding on this individual, but CTC itself should know better. In cycling terms, CTC is an incredibly ancient organisation. Founded in 1878, they're one of the very oldest cycling organisations on the planet and have had a whopping 135 years in which to campaign for cyclists. That's eight times as long as it took to transform the Netherlands. Unlike the newer organisations, CTC has been there fighting for cyclists, for the entire post-second-world-war period over which cycling has declined. Time is clearly not the issue. There has been plenty of time for Britain to have achieved all that the Dutch have, and more. Many people have worked very hard for cycling, they've given much of their time over many years, yet progress has not been made. Why ? So what went wrong ? Campaigners in Britain seem to suffer from several problems. They have shown themselves to have low aspirations, not daring to ask for the proven success of the Netherlands to be replicated but instead trying to find some alternative route to mass cycling. I've noted before that the Cambridge Cycling Campaign does not hold the council to high enough standards. This has continued since this blog post was written with the group asking members to support a substandard proposal for roads in their city. Other local groups in other areas of the country have done likewise. Local groups, of course, are run in a small budget and have relatively little influence. LCC still asks for second rate infrastructure in London. They've moved from one campaign to another, and the over-active marketing people have produced a vast pile of press releases along the way. In the PR world of LCC there are always more successes to celebrate, but what they're calling for is lacklustre. For access to the Olympic park in London, LCC requested infrastructure which is worse than that provided for an average Dutch town's small scale sporting facility. "Going Dutch" was accompanied by calls for Advanced Stop Lines and a bizarre requirement for cyclists to turn 270 degrees to the left in order to make a 90 degree right turn was approved of and boasted of by LCC. For many years, Sustrans has been happy to rubber stamp infrastructure which is of far too low a quality and I've quite a lot of experience with the results. I've pointed out ten years ago that Sustrans routes are impractical because they're often far more indirect than roads to the same locations. 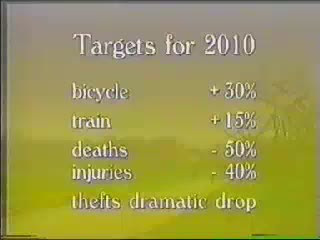 In 2006 I had to brake for an underpass through which it was impossible to cycle and then was forced to take to the road because one of their paths proved to be dangerous. Others have also pointed out that Sustrans puts their name on routes which are simply not of a quality that one can cycle on them. Sustrans continue not to understand how to make cycling useful for the majority of the population. Since writing this piece, Sustrans have blamed users of their paths for going "too fast". In fact, the conflict which was seen was a direct consequences of Sustrans' design - which mixes walking children with commuting cyclists on a narrow path. They then went on to rubber-stamp a dangerous roundabout design in Bedford which would mix cyclists with trucks on a turbo-roundabout, a junction design which is absolutely not suitable for cyclists even if they're very fast, and which would definitely not work for the independent 11 year olds that Sustrans usually claims to design for (since this blog post was written, the problems with Sustrans have continued. Sustrans have released a cycling infrastructure design standard of appalling quality and backed several other items of bad design in places including Southend). policy in the UK ? The other fundamental problem has been the dogged adherence of "cyclists" in Britain to the ideology of riding on the road. This has led to CTC standing firmly in the way of Britain building the infrastructure which is required to grow cycling, while an increasing majority of the population see cycling as something alien to them. 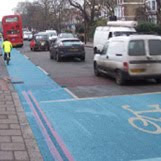 CTC has sadly long had difficulty with seeing the benefit of segregated cycling infrastructure. Bizarrely, they did approve of segregated motoring infrastructure in the form of motorways. 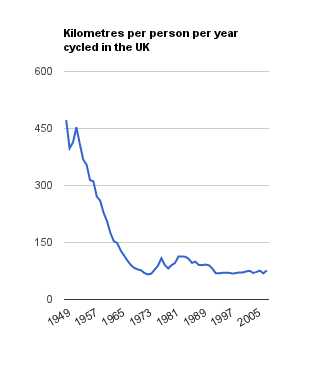 CTC's emphasis has largely been on training, though that's been proven not to increase cycling, and indeed the amount of cycling in the UK now is somewhat down from what it was when the CTC was at its greatest. CTC have also been active in approving of bad design including a roundabout in York and joining with Sustrans to approve the lethal Bedford roundabout design. They've leant their name to cheering about such things as small improvements in cycle parking. There remains great suppressed demand for cycling. People gather at events at which they can cycle in safety. However outside of those events the public image of cycling in Britain is largely of an extreme sport that only "cyclists" take part in. Cyclists are viewed as being militant and angry outsiders. In part this is a result of cycle campaigning which has focused only on the needs of "cyclists" and therefore excluded other people from taking part. It also doesn't help that cycle campaigners often take an anti-car stance which separates them from the majority. It's worth bearing in mind that the Netherlands has achieved more than anywhere else for cycling with remarkably few anti-car policies. It's not good enough to say that conditions are good enough for everyone to cycle just because you, as a self-selected member of the small percentage of people who cycle find conditions to be good enough now, already cycle. Other people won't do it until it feels safe for them. An emphasis on training cyclists while still asking for infrastructure which suits only those who already cycle has helped the decline of cycling because it does nothing to address the most common reason why the majority do not cycle. What do we want ? Gradual change. When do we want it ? In due course ! Think what the target actually is. If you want cycling to grow from 1% of journeys to 27% of journeys and for cycling to be normal for everyone then it must be inclusive of everyone. Cycling should not be just about "cyclists". Cycling is beneficial for all of society. Children should be able to go to school unaccompanied. Parents should be freed from the school run. All adults who currently feel that they have no alternative but to drive and who find it expensive and stressful, should be able to choose to cycle. Elderly people and those with disabilities should also be able to experience the freedom of cycling. Society suffers from all the well known adverse effects of excess driving, such as rat-running, road rage, obesity, air and noise pollution and the violent deaths of thousands of people every year. This is why cycle campaigning needs to grow to be inclusive and not be focused on a tiny minority. There is really only one place worth looking to in order to find the answers, and that is the one place where these things are already true: The Netherlands. Don't dilute demands by asking for what is unproven or by following examples from elsewhere which have achieved less. Ignore anything which was tried and abandoned in the Netherlands because there is no need to copy mistakes from here or elsewhere. successful policy in the UK ? The future is what you make it. Demand nothing less than best practice loudly enough, repeat it often enough, and make sure that the full benefits for everyone are known and something just might happen. While a multitude of cycling organisations all of which have multiple ideas about what they want, which between them give a mixed and difficult to understand message and which will often offer government an easy and cheap way out, progress is nearly impossible. There is nothing magical about what happened in the Netherlands forty years ago. This country simply decided on sensible policies which were good for society and it has stuck with them ever since. The claim has not always been "40 years"
I can remember when campaigners and officials in the UK claimed that the Netherlands was 20, 25, 30 and 35 years ahead. It's the same claim, but it is periodically for the ever longer period of time while no progress is made in Britain. What does this mean precisely ? It makes no sense whatsoever to justify a a further delay in making cycling accessible to everyone in Britain just because, 20, 30, 40 or 50 years have already been wasted. Fifty years ? Well, if we don't start to jump on people who make this statement, as well as those who use the other excuses for inaction, we're still going to be hearing the same sad refrain in another ten years time. Being "forty years behind" is no accident. This didn't suddenly sneak up on people, it took forty years to happen. No, being "forty years behind" in cycling is the result of forty years of making deliberate choices not to build the infrastructure which is required to support cycling. It was enabled by forty years of campaigners not saying enough to stop it. If you want to see for yourself how the infrastructure and policy have combined to get everyone to ride bikes in the Netherlands, there's a study tour in May on which we demonstrate almost everything featured in the many posts on this blog in just three days. The chant in the title is Kate Fox's idea of what "a truly English protest march" would sound like. It comes from her book "Watching the English". I find it interesting that the 38 page long "Rules of the Road" section of her book goes to much effort to explain how wonderful British drivers are but doesn't actually mention cycling at all, even though it says in the introduction on the first page of this section that it will discuss cycling. That this mode of transport is practically invisible even to an anthropologist studying the English says something about how commonly people cycle in that country. The Cycling Embassy of Great Britain can rest easy for now. They've only been going for about two years and that's only a quarter of the time that it took for the Netherlands to get to the point that journalists from New Scientist were impressed. But has a quarter of that progress been made in Great Britain in the last two years ?